I have since 2003 done a few bunkertours as a leader for the trip. Both in Sweden and Europe and with focus on underground sites from the second world war and into the cold war. A detailed ”top to bottom” tour of the 7,5 cm battery from the 1960’s. We climb one of the turrets from the inside and explore 99% of all spaces within the fortress. The tour also visits two shelters outside and the measuring station that is not included on ordinary tours. Groups between 8-15 is prefered. En mycket detaljerad genomgång av Femörefortet, Oxelösund som innehåller bla tre 7,5 cm kanoner från 1960-talet. Vi klättrar bla upp i ett av tornen innifrån och utforskar 99% av hela fortet på insidan. Guidningen innefattar också en vandring på ytan där två skyddsrum besöks och även mätstationen som inte ingår i den vanliga visningen av fortet. Grupper i storleken 8-15 personer rekommenderas. There are three major installations on Hemsö that is accassible for visitors. Storråberget with its three twin-barrel 15,2 cm guns, Havstoudd with three 7,5 cm guns and Kläffsön, a measuring station. Between 24 and 30 hours is spent on the island with overnight in one of the fortresses. Groups from 5 to 25 people. På Hemsön utanför Härnösand finns tre störra anläggningar som går att besöka. Storråberget med tre dubbelpjäser på vardera 15,2 cm, Havstoudd med tre 7,5 cm pjäser och Kläffsön, en modern mätstation. Mellan 24 och 30 timmar spenderas på ön, med övernattning i ett av batterierna. Grupper på mellan fem och 25 personer. Oxelösund should have been heavily defended during the cold war with men and guns. A walk through the city center with maps from the 1950’s and 1960’s tells the story on how these strongholds where supposed to be built. Out in the archipelago there are also remains both from the 2WW and cold war, some still possible to visit. Citykärnan skulle ha varit kraftigt försvarat under början av kalla kriget med ett stort antal skansar. Med hjälp av kartor från 1950 och 1960-talen kan historien berättas hur dessa skansar skulle försvara staden. Runt om i skärgården finns ocskå lämningar, framförallt från andra världskriget och vissa är fortfarande möjliga att besöka. 2004-04-03 – A trip through 500 years of fortification history in Nyköping/Oxelösund area, held by the Femöre fortress society. Visits at places from the 16th centrury to the 20th. 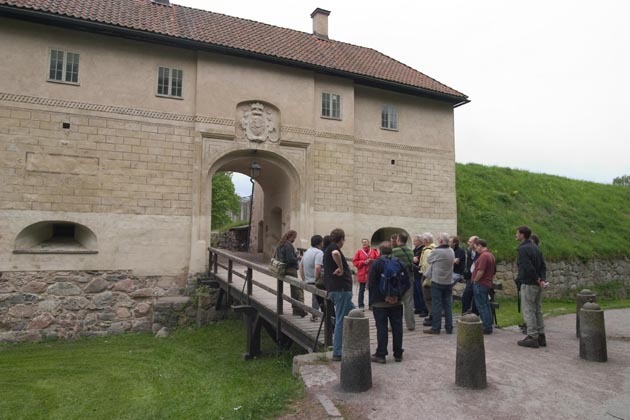 2004-06-01 – First visit from England with 4 bunkertourists visiting the grand opening of the Femöre fortress. 2005-02-12 – Trip within the Femöre fortress society to the Tunabergs peninsula, where the sisterbattery to Femöre was placed. 2005-07-07/10 – Trip to London area for bunkers and also the Duxford airshow. Trip disturbed by the London bombings. 2005-09-24/25 – Coastal artillery trip south of Stockholm, held by the Femöre fortress society. Visits on Järflotta and Landsort. 2005-09-25 The whole group in the ammunition storage in one of the 12/70 guns. 2006-06-08/11 – Trip with 15 britts around Stockholm with visits at Femöre, Nyköping, Siarö, Rindö, Värmdö, Landsort and central Stockholm. 2009-06-08 The start of the trip was the Nyköping castle. 2006-11-11/14 – Trip with 10 britts from Nyköping, via Kjula airbase, Gävle, Hemsö, Söderhamn and Enköping. 2007-06-03/06 – Trip with eight Swedes to Germany for the 5001 bunker and the Falkenhagen site. 2007-08-30/09-02 – Trip with five Swedes and four britts to Trondheim area for Östersund, Åre, Kråkvåg, Austrått, Trondheim and Hegra. 2007-10-27/28 – Trip with nine Swedes to Hemsö. 2008-03-02 – Arranged visit to Kungliga Borgen, Stockholm for SFHF. 2008-05-01 – Arranged visit to Askö island, Södermanland for SFHF. 2008-05-25 – Arranged guided tour inside the ERSTA battery on Landsort for the Tekniska Museets Vänner. A total of 65 persons during the day. 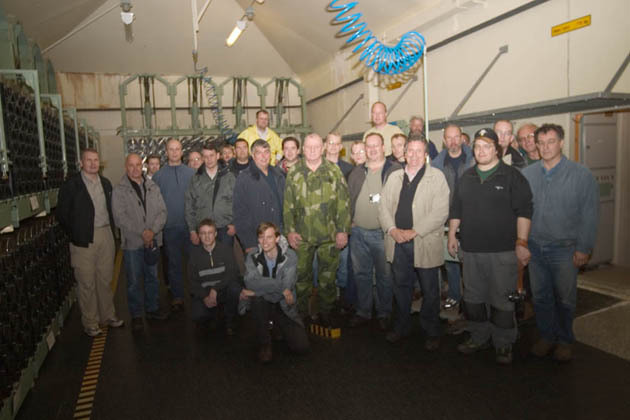 2008-09-01 – Talked about ERSTA with visit at 2nd and 3rd gun at Landsort at the Nordic fortressforum visit. A total of 17 persons. Also joined them to Muskö the day after. 2008-09-20 – Headed one of the annual longer tours of Femörefortet. A 5h tour with 8 people. 2009-01-17/19 – Tour with english friends, Stockholm, Norrtälje, Arholma and Västerås. 2009-09-05 – Headed one of the annual longer tours of Femörefortet. A 5h tour with 13 people. 2009-10-03/04 – 3rd organized tour to Hemsö area, now with 17 Swedes and 6 britts. 2009-10-25 – 5h tour of Femöre fortress for a private party. 2009-11-07 – 5h tour of Femöre fortress. See the fortress webpage for info on how to book. 2010-05-12–17 – Ukraine as part of a 16 people gang. Balaklava, object 221 and a missile museum was the military history part. Chernobyl was also visited. 2010-07-04 – City walk of Oxelösund. 2010-08-22 – City walk of Oxelösund for 9 people. 2010-08-22 – 5h special tour of Femörefortet for 10 people. 2010-08-31 – Tunabergshalvön och resterna av batteri BÅ visas för en grupp i Nävekvarn. 2010-10-16 – ”DN underjord” day. In charge of coordination between DN and SFHF. 2011-05-06/09 – Greater Stockholm underground tour for 37 Englishmen. 2011-10-08/09 – 24h on Hemsö. 4th trip now with 20 Swedes. 2012-04-27 – Tour to battery Arholma together with SFHF. 2012-05-26 – Guide on Landsort when Statens Fastighetsverk had open day at the 12 cm m/70 gun. 2012-06-17,20 – Showed the Vaxholm defence line and Femore fortress to Terry Magovern (USA). 2012-10-19/21 – Greater Stockholm area for 7 englishmen. 2012-10-21 – Guided Loudden oil depo during ”DN under jord”. 2012-11-16–18 [link=http://www.bunkertours.se/page.php?12]Berlin trip with six major bunker visits[/link]. 2013-01-19 – Guide on visit to both batteries at Landsort. 2013-03-13–17 – Tour with up to 20 guests to Landsort, Järflotta, Arholma, Gävle and Hemsö batteries. 2013-04-13–14 – Arranged 2 day tour of Karlskrona as part of the SFHF annual meeting. 2013-05-17–20 – Hosted SubBrit european weekend tour with 38 guests in Göteborg area. 10 major sites in three days. 2013-08-17 — Both batteries on Landsort for 20 people. 2013-11-17 – 5h tour of Femörefortet. 2013-11-15 – Short trip to BOC Danish first governmental bunker outside Helsingor. Civil defence central Älmhult on the way home.